I approached the entrance to Ft Belvoir's medical facility last year as an old veteran puttered towards me. Easily over 80 years old, stooped and slow, I barely gave him a second glance because on his heels was a full bird colonel. As they approached, I rendered a sharp salute and barked, "Good morning, Sir" Because they were heel to toe, I began my salute as the old veteran was about two paces from me. He immediately came to life! Transformed by my greeting, he rose to his full height, returned my salute with pride, and exclaimed, "Good morning, Captain!" I was startled, but the full bird behind him was flabbergasted. The colonel stopped mid-salute, smiled at me and quietly moved on. As I entered the clinic, the utter beauty of the encounter preoccupied me. What prompted the old man to assume that I was saluting him? Perhaps he just thought, "It's about time!" After all, doesn't a WWII vet outrank us all? I turned my attention to the waiting room taking a moment to survey the veterans there. Service people rushed around, loudspeakers blared, the bell for the prescription window kept ringing. It was a whir of activity and the older veterans sat quietly on the outside seemingly out of step, patiently waiting to be seen. My old friend stayed on my mind. I began to pay attention to the military's attitude towards its veterans. Predominately, I witnessed indifference: Impatient soldiers and airmen plowing over little old ladies at the commissary; I noticed my own agitation as an older couple cornered me at the Officer's Club and began reminiscing about their tour in Germany. 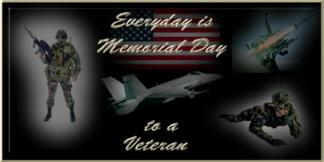 To our disgrace, I have also witnessed disdain: At Ramstein AB terminal, an airman was condescending and borderline cruel with a deaf veteran flying Space A; An ancient woman wearing a WAGS button was shoved aside by a cadet at the Women's Memorial dedication in D.C.; A member of the Color Guard turned away in disgust from a drunk Vietnam vet trying to talk to him before the Veterans Day Ceremony at the Vietnam Wall. Have you been to a ceremony at the Wall lately? How about a Veteran's Day Parade in a small town? The crowds are growing faint. Why do we expect the general public to care if we don't? We are getting comfortable again. Not many of us around that have been forced to consider making the ultimate sacrifice. Roughly 60% of today's active duty Air Force did not even participate in Desert Storm. I always lament about the public's disregard for the military. I do not count all the days I stayed in bed instead of going to a ceremony or parade. It was my day to be honored and I deserved to sleep in. It's just like a 28-year-old, whose weapon was "Microsoft PowerPoint Slide Presentation" during the last conflict, to complain about recognition. Sometimes I wonder who is going to come to our parades in 20 years; will anybody look me up in the Women'sMemorial Registry? The answer lies in the present. We will be honored as we honor those who have gone before us. The next generation is watching. It is not my intention to minimize the selfless service of our modern military; my comrades are the greatest people I know (and frankly should be treated better). But, lately I'm wondering if the public's attitude towards the military isn't just a reflection of the active duty military's attitude towards its own veterans. It's time to ask - do we regard them, do we consider them at all? How does our attitude change when the hero is no longer wearing a uniform? I was proud to wear my uniform. Can I admit that I thought I was cool? There is no denying that there is something about our profession, combined with youth that feeds the ego a little. We have all seen a young pilot strut into the Officer's Club with his flight suit on. He matters; he takes on the room; he knows he can take on the world. But, one day he will leave his jet for a desk, and eventually he will have to hang up that flight suit. A super hero hanging up his cape how will we measure his value then? He will no longer look like a pilot, an officer, a colonel. He'll just look like an old man coming out of the clinic with his prescription. But, is he less of a hero? Will anybody remember or care about all the months he spent away from his newborn daughter while making peace a possibility in the Balkans? Probably not. Our society has a short memory. Maybe it is not for the protected to understand. Rather, it is my hope that when a young lieutenant walks by him they will each see themselves reflected in the other-one's future, the other's past. In that moment, perhaps, the lieutenant will also see the hero, now disguised as an old man, and thank him. The truth is there are heroes in disguise everywhere. I used to wonder why people would want to chat with me when I was in uniform - telling me about their four years as a radio operator in Korea. So what? I wasn't impressed relative to my own experiences. Now I understand that they were telling me because nobody else cared. Proud of their service, no matter how limited, and still in love with our country, they were trying to stay connected. Their stories were code for: "I understand and appreciate you, can you appreciate me?" The answer is, yes. I separated from the Air Force in February. I'm out of the club. Still, I want you to know that I'll attend the parades, visit the memorials, and honor you. All this while my kids and your kids are watching.Then, maybe, someday when I'm an old woman riding the metro, a young airman will take a moment of her time to listen to one of my war stories. I, in turn, will soak in her beauty and strength, and remember. What a great world it would be if all our elderly veterans wore recognition pins and we could salute them even if coming out of a Seven-Eleven. Yes this started out as a misunderstanding on my part. but now I get it, That day was the first day in my life that I really understood what it meant to salute someone. Dear Veteran, I reconize and hail you! I do understand what I have and what you gave to make it possible. So I'm wondering if we meet on the street again-may I salute you?